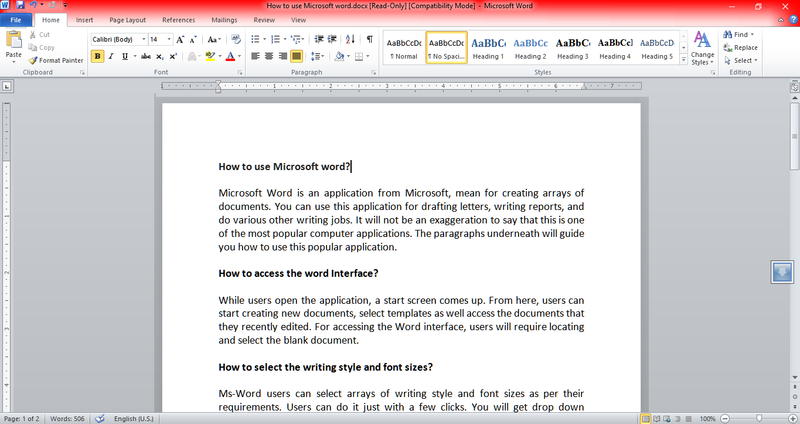 Microsoft Word is an application from Microsoft, mean for creating arrays of documents. You can use this application for drafting letters, writing reports, and do various other writing jobs. It will not be an exaggeration to say that this is one of the most popular computer applications. The paragraphs underneath will guide you how to use this popular application. How to access the word Interface? While users open the application, a start screen comes up. From here, users can start creating new documents, select templates as well access the documents that they recently edited. 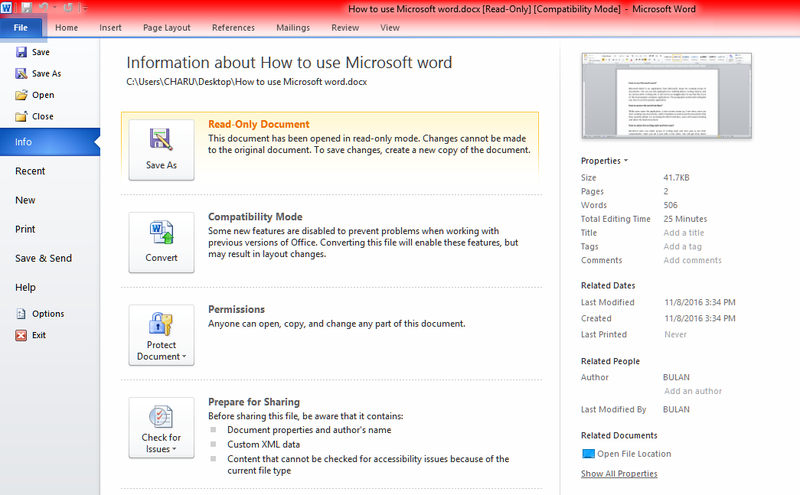 For accessing the Word interface, users will require locating and select the blank document. How to select the writing style and font sizes? 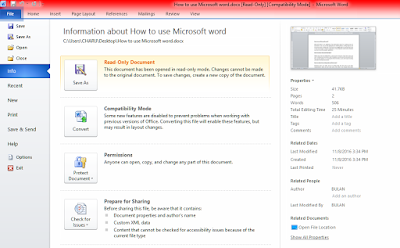 Ms-Word users can select arrays of writing style and font sizes as per their requirements. Users can do it just with a few clicks. You will get drop down towards the top-left hand corner. You need to select the write-up and pick the writing style and the font size. You can do this by pressing the Control + A key together. Once the entire write up to get selected, you can select the font size and the writing style as per your needs. Who says that the word documents inevitably needs to be in contrast of white and black. You can make the background of the document as well as the letters colorful. There are icons for color selection on the home tab. These icons lie just under the drop-down boxes for selecting the writing style and the font size. Select the entire write up and choose the background color and the colors for the fonts, from the dropdown. How to insert diagrams, charts and other visual effects to the word document? You can even include special graphical characters to the word document. You will get the “Insert” tab on the top panel and you need to click on it. Once you go to the insert tab, you will get icons to insert clip arts, table, Shape as well as diagrams to the word document. Especially while writing longer documents or you require drafting official documents, you will require an inserting header, footer and page numbers. There are icons on the “Insert'' tab to accomplish these functions. How to design the page layout? The Ms-Word dashboard has got a separate tab to manage the page layout. This function enables the users to set margin, add watermark, page borders, and themes to the word document. With the passage of time, Microsoft has constantly bringing update and each version have come up with distinct and unique features. 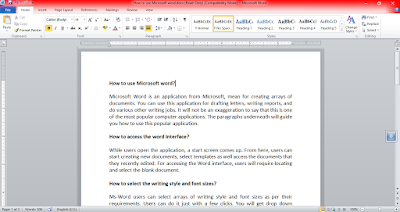 The latest version is Ms-Word 2016 that has already earned a massive popularity among the users. It includes unique features like Quick Access toolbar, backstage view, and Ribbon. If you are going to use this version for the first time, you can refer to the videos online, teaching as for how to use this application. 1. How to use Microsoft Excel? 2. HOW TO MANAGE CALENDAR IN WINDOWS 10?